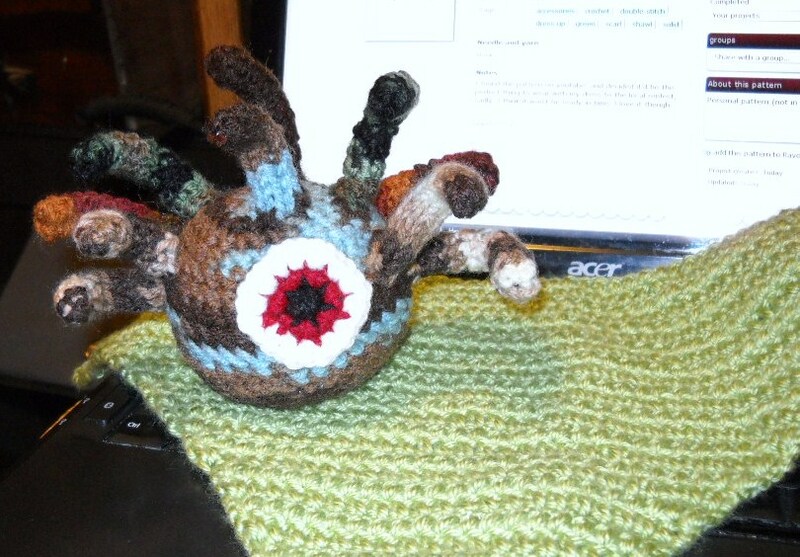 Bertha is the first of eight or nine beholders that I am making as Christmas presents for my gaming group. Like most beholders she’s got one big eye in the middle, and ten tiny eyestalks all around. Yarn – After asking my boyfriend about beholder coloring I settled on earth-tones with a sprinkling of other colors like blue. A crochet hook. Use the suggested size hook for your yarn, this little gal was made with a H/8 5.00 MM hook. Stuffing – Some people use scrap yarn, other use the white fluffy stuff you see in stuffed animals. Pipe Cleaners in color similar to your yarn. A tapestry needle for sewing in ends and putting it all together. To make a beholder, all you have to do is make a ball and ten little tubey things, and a flat circle as the eye. To make the ball(your body), cast on six stitches in the round. I use the magic circle, though some people chain two and single crochet six stitches into the first chain. Either method works. This doll is made in continuous rounds so you’re going to want to mark your first stitch. After you have joined your ring you’re going to work two SC into every stitch til the stitch marker. Row 2: *2 sc into one stitch, 1 sc into the next* repeating from * to * until end of row. Row 3: *2 sc into one stitch, 1 sc into the next 2 stitches* repeating from * to * until end of row. Row 4: *2 sc into one stitch, 1 sc into the next 3 stitches* repeating from * to * until end of row. Row 5: *2 sc into one stitch, 1 sc into the next 4 stitches* repeating from * to * until end of row. Row 6: *2 sc into one stitch, 1 sc into the next 5 stitches* repeating from * to * until end of row. Row 7: *2 sc into one stitch, 1 sc into the next 6 stitches* repeating from * to * until end of row. Rows 8-12: 1 SC in every stitch until end of row. Row 13: *SC2Tog, 1 sc in next 6 stitches* Repeating from * to * until end of row. Row 14: *SC2Tog, 1 sc in next 5 stitches* Repeating from * to * until end of row. Row 15: *SC2Tog, 1 sc in next 4 stitches* Repeating from * to * until end of row. Row 16: *SC2Tog, 1 sc in next 3 stitches* Repeating from * to * until end of row. Row 17: *SC2Tog, 1 sc in next 2 stitches* Repeating from * to * until end of row. Row 18: *SC2Tog, 1 sc in next stitch* Repeating from * to * until end of row. Here you’re going to have a little opening left, stuff your beholder with your chosen stuffing. Finish off the bottom of your beholder by SC2TOGing until the hole is small enough to sew closed. Cast on six stitches in the round. Row 1-14: SC into Every stitch THROUGH BACK LOOP ONLY. I did the eyestalks working backloop only because it lends a scaly look to the outside of the tube. You can work through both loops if you like, but this is what I did. When you’re finish leave a long tail for sewing the eyestalk to the body. Pick three colors. I used black, red, and white. Cast on six stitches in the round in your pupil color(my black). Row 1: Switch to iris color (Red) and 2SC into every stitch around. Row 2: Switch to last color (white) and again 2SC into every stitch around. Bind off and leave a long tail of the final color while tucking any tail of the middle color. Leave out the tail of your pupil color, the free tales will help attach the eye to the body. Starting with the eye use the cast on tail to attach your eye from the center to the body of the beholder. Cut off any excess. Using the outside color tail sew around the outside edge attaching the eye firmly in place. Take pipe cleaners and cut them into lengths double that of your eyestalks. Bend each in half and insert them into the bottom of your eyestalks. If the top of the eyestalk is loose use the tail on that end to cinch it or sew it shut. Sew the eyestalks to the top of the head of the beholder and bend them all to look in the same direction as the eye. I hope you all enjoyed my first attempt at writing a pattern. Let me know if you make one. I’d love to see it. D L Dzioba is an aspiring novelist living in the foothills of North Carolina.